The main feature of this page is a 3D modeling article. reviewing the two iPad concepts I developed for my first MODO-only tutorial, "Modeling with MODO, Volume One", released in November 2009. 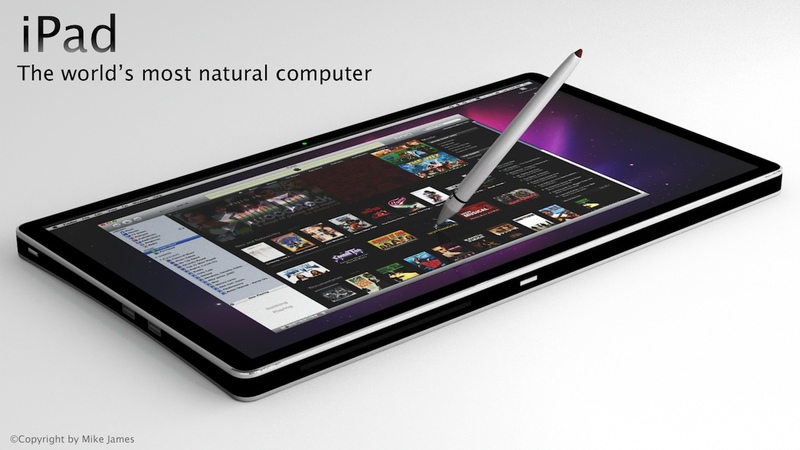 (minus the Apple references, to avoid potential trademark conflicts) See the ACTUAL "iPad", on Apple's site. This is before the actual iPad's release, and my use of the name "iPad" was just a guess at the time. 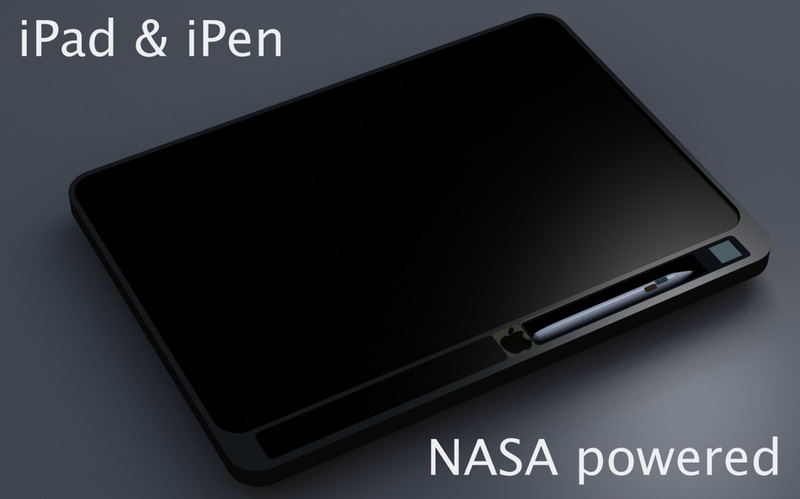 In late 2008/early 2009, I created a 3D concept for a future Apple laptop/tablet/desktop combo unit. It had absolutely nothing to do with any real Apple plans that I knew of, and was based more on an iMac-type design, rather than an iPhone-type design. 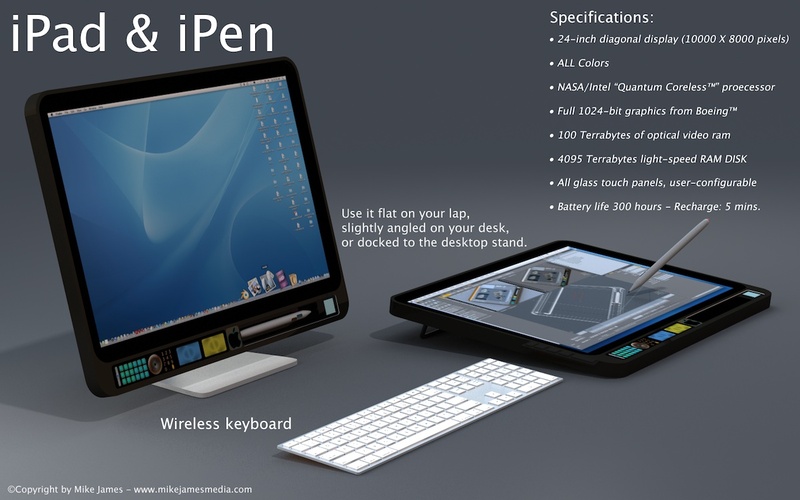 Ultimately, one of my renders of that concept appeared in MacLife Magazine, as "Photo of the Month", in October, 2009. 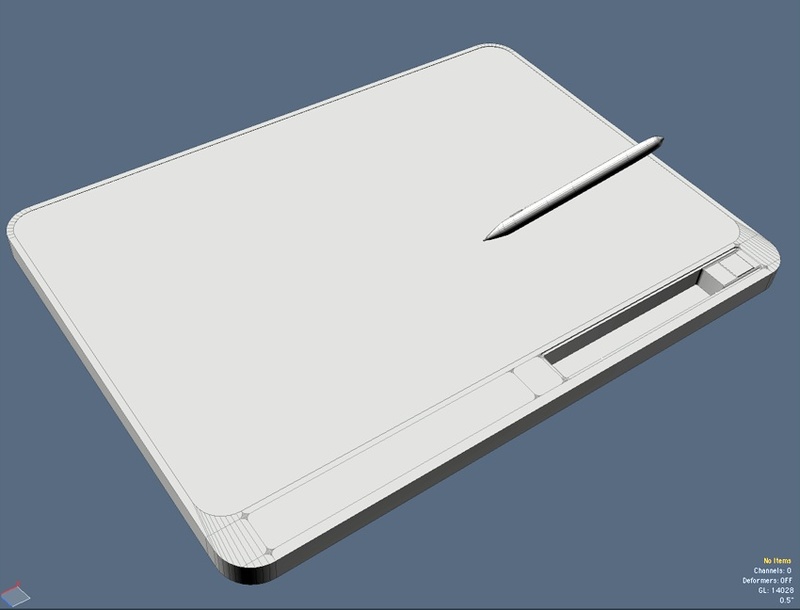 By then, I suspected that if such a device were released, it would look something more like it does, and so I created an updated model for an iLounge's "Design the Apple Tablet" contest. Both versions of the 3D model are included on my "Modeling with MODO, Volume One". For the kinds of applications we currently use on the iPad, I certainly agree that no stylus is required. 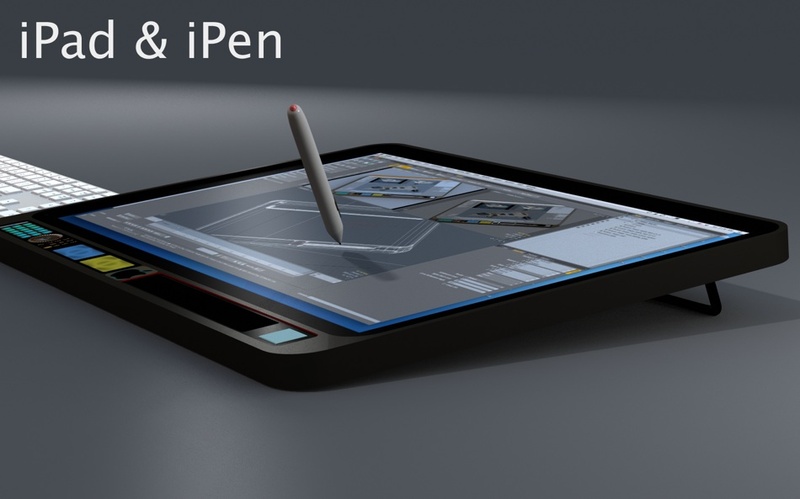 But, as a person who hopes to eventually have an iPad-like device that can run larger applications, (like 3D modeling software) a stylus would be mandatory. That's why it's included in my vision of the device. *Update: Using my original iPad since April of 2010, and it's still perfect! I received my (actual) iPad on April 3rd, 2010, and absolutely love it. It's far more robust and useful than expected, and I couldn't be happier. I made one change, which was to upgrade to the 3G version. That's only because things changed for me since I placed my order, and I now find that I need the 3G version. Otherwise, both models are identical, and I love the new one just as much. Here's what interests me about this product, and why I've taken the iPad plunge. This is the first generation iPad, and the SDK was just released, too. And, there will be a big backlog of orders. So, I figure that it will be a while before the hardware is upgraded substantially. I'd bet that I have at least 9 months before "version two" comes out, and I can use the iPad in the meantime, for all the above stuff. This will be a handy device for sketching out ideas on the go, thanks to Autodesk's "Sketchbook Pro" being released for the iPad. I've used it, and it's excellent! It's another publishing medium that will become popular, thanks to Apple. If you produce digital media of any kind, then the iPad is a new way for others to see it. (MUCH better than a phone) You can publish books through iTunes, and those "books" can contain not only text, but images, audio, and video. I think this has huge potential. I've used Macs since they first existed, and exclusively, since 1995, and am loving it more all the time. Typically, as Steve Jobs often says, "Everything just works." Because of that experience and the resulting trust, I'm confident that this first iPad is solid. 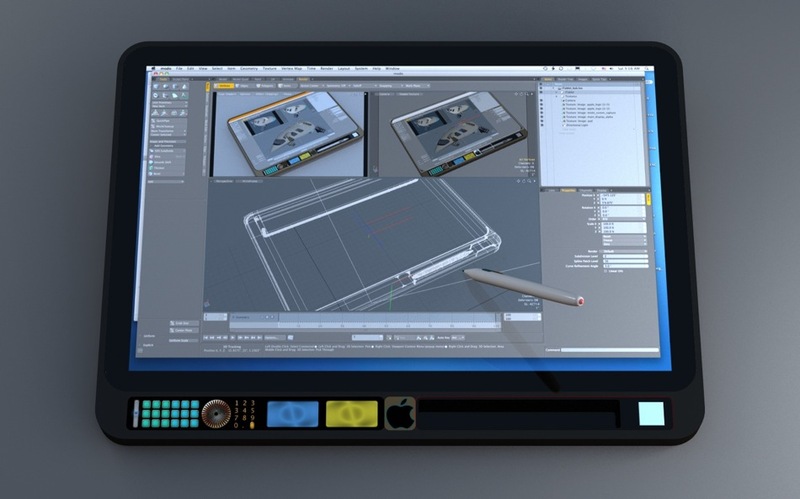 And then there's the fun stuff... Music, Movies, new apps that will appear, etc..
Apple "Touchscreen laptops" in a few years? Touchscreen technology in general has obviously caught on, thanks to the iPhone and now, the iPad, and it's clear to me that eventually we'll see this in a more powerful form. As a graphic artist, I use pen (Wacom) tablets all day. So, I would love to see a serious (OS X-powered) version of this technology, in a slightly larger size. The combination of touch technology, combined with the ability to use a stylus, would make this the computer for me. There's quite a bit of evidence, suggesting that we'll see this at some point, and so with that in mind, I built this more Apple-styled version. It's about what you'd expect, (ports, etc.) except that I added a concave bottom, for better cooling, and a snap-in stylus holder on the right side. One of the business-worthy attributes of the current iPad is that it's a way to carry nice presentations with you, and show them at a moment's notice. Because of it's size and ability to flip the display, using the accelerometers, and even pass it around a table, it's more flexible than a laptop. If you could have that ability, plus the ability to use it as a true laptop substitute, that would be a huge bonus. Forget about reality... I just want this thing! I really like the way some apps feel, with a pen and tablet for control. MODO works well this way, using my Wacom Intuos 4 (medium). Most tablet devices have been too expensive for me to qualify buying one, but I sure do covet them. Something like a Cintiq really makes a difference, because you can "draw" right on the image, rather than on a separate pad, while looking at a monitor. 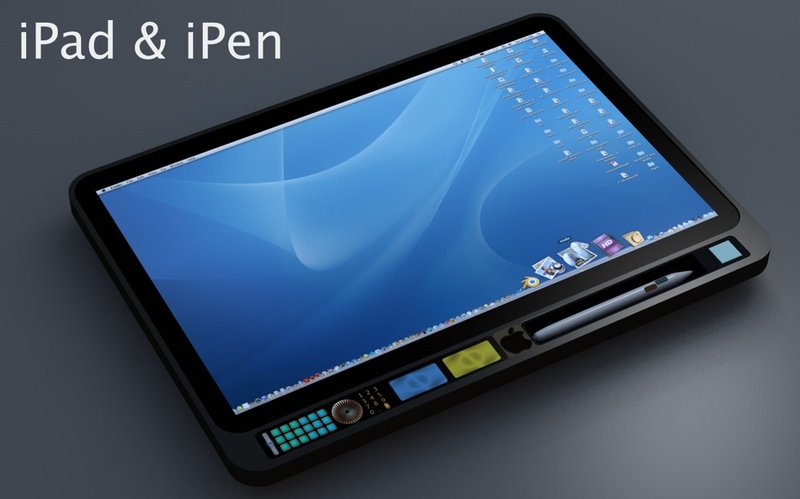 The case design is very Mac-esque, resembling the one-piece iMac designs from 2008/2009. 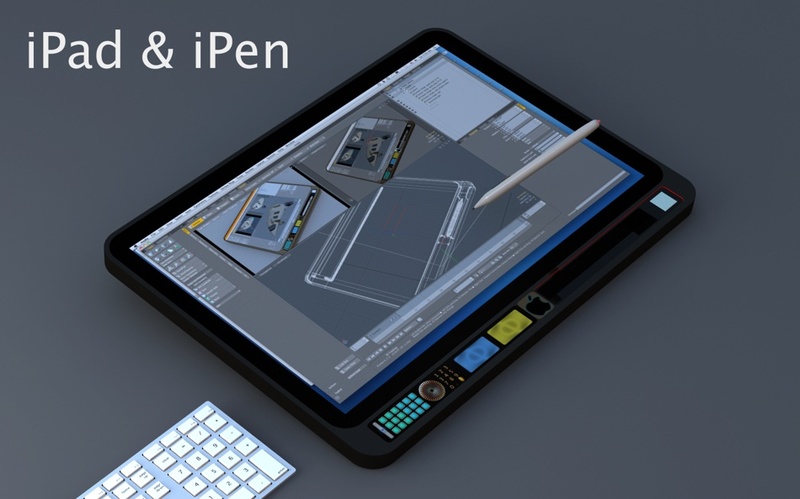 It's only .75" thick, however, and has the pen features built in, as well as "all glass" controls, like the current iPod and iPhone. Everything else is imaginary. The main computer case in straight polygon modeling, with no sub-d effects. The pen (below) is sub-d. Both models are very simple. The images used for the display screen and glass "controls" at the bottom give it a more complex look. I offset the buttons on the pen, because it's ergonomic... When you reach for the higher button, your finger curves, so it makes sense the the upper button would be more to the right. (for right-handed users) I also thought that two discrete buttons would be a better choice than a rocker switch.